You can broadcast your PowerPoint presentation over the Internet to a remote audience. 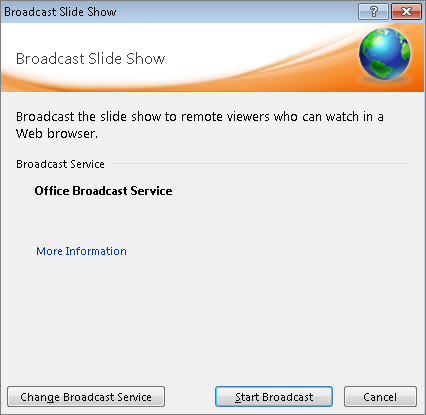 While you present the slide show inside PowerPoint, your audience members follow along in their web browsers. Depending on which version of PowerPoint you're using, select either Newer versions or 2010 below to see the right instructions. In PowerPoint 2013 and newer versions, you may deliver your presentation from PowerPoint by using the Office Presentation Service, a free, public service that allows others to follow along in their web browser. No setup is required. Use your free Microsoft account to get started. In PowerPoint, close any open presentations that you don’t want to share. Click Slide Show > Present Online > Office Presentation Service. Select the Enable remote viewers to download the presentation check box if you want to allow your audience to download a copy of the presentation file. Important: You won’t be able to email your presentation directly from PowerPoint on a Windows RT PC. Instead you can open an email program, create your email, and attach the presentation to it. When you are ready to start your presentation, click Start Presentation. To end your online presentation, press Esc to get out of Slide Show View, and then on the Present Online tab, click End Online Presentation. 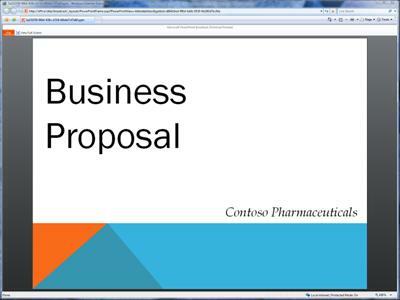 To confirm that you want to end the presentation, click End Online Presentation. Note: You'll need a hosted broadcast service provided by your organization to broadcast your PowerPoint presentation to a remote audience. A Microsoft account (hotmail.com, outlook.com, msn.com, live.com) can be used with the Microsoft PowerPoint Broadcast service in PowerPoint 2013 and later. 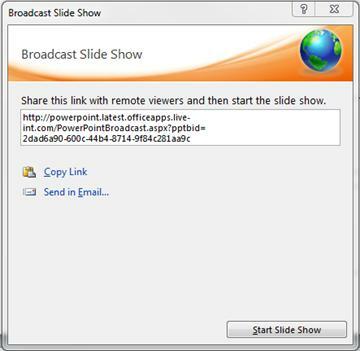 In PowerPoint 2010, the Broadcast Slide Show feature in PowerPoint 2010 lets you share a slide show with anyone, anywhere, over the web. You send a link (URL) to your audience, and then everyone you've invited watches a synchronized view of your slide show in their browser. You can send the URL for your slide show to attendees by e-mail. During the broadcast, you can pause the slide show at any time, re-send the URL to attendees, or switch to another application without interrupting the broadcast or displaying your desktop to attendees. Choosing a broadcast service The Broadcast Slide Show feature requires a network service to host the slide show. To use this service, a broadcast site must be set up by the site administrator and audience members must have access to the site. 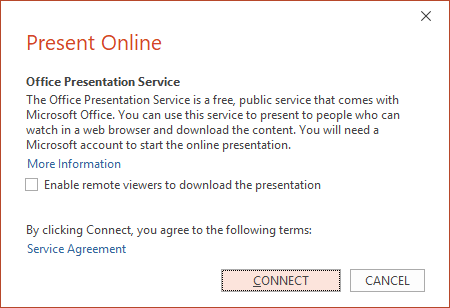 A PowerPoint Broadcast Service is available in PowerPoint 2013 and later for folks who have a Microsoft account (hotmail.com, outlook.com, msn.com, live.com). Important: Anyone with the link to your slide show can view it! If an invited audience member forwards the link to someone else, that other person can view your slide show as well, provided that they have access to the service. Internet connection You need to be connected to the Internet or have access to a broadcast site on a server with the Office Web Apps installed in order to use this feature. Supported browsers The broadcast slide show feature can be viewed in the Internet Explorer, Firefox, and Safari for Mac browsers. File size limits The service you use might impose a limit on the file size for broadcasted slide shows. Any transitions in your presentation are shown as Fade transitions in the browser. Screensavers and email pop-ups can disrupt the audience's view of the slide show. Audio (sounds, narration) is not transmitted to the audience through the browser. You cannot add ink annotations or markup drawn onto the slide show during the presentation. If you follow a hyperlink in your presentation to a Web site, the attendees only see the last slide you showed in the original presentation. If you play a video in your presentation, the browser does not show it to the audience. On the Slide Show tab, in the Start Slide Show group, click Broadcast Slide Show. The Broadcast Slide Show dialog box opens. If you want to host your slide show on the service listed under Broadcast Service, skip to the next step. If you want to use some other service to host your slide show, click Change Broadcast Service. Under Choose a broadcast service, select the service that you want to use. For more information about broadcast services, see Choosing a broadcast service. Note: If you do not see the service that you want to use, select Add a new service, and then in the Add Broadcast Service dialog box, enter the network address of the service you want to use and then click Add. After you select your broadcast service, click Start Broadcast. PowerPoint then creates a URL for your presentation. To send the URL for your presentation by email, click Send in Email. To copy the link, click Copy Link. When your audience receives the URL for the slide show, click Start Slide Show to begin your broadcast. After you finish presenting and are ready to end the broadcast, press Esc to exit Slide Show view and then click End Broadcast.